How to add form to my blog? Hello, how do I add my form on my blog? I'm having trouble, you can help me. I am Brazilian and I liked the form, but can not use. First off, I'd like to welcome you to JotForm. May we know which platform you are using for your blog? If you are using self-hosted Wordpress, you may refer to this short video to learn how to add a form to your blog. If your blog uses something else, please let us know what it is and give us the url for your blog so we can inspect it and come up with a proper solution. Thanks! I use blogspot, following page. I'll put the link on the menu I want to contact and add it into this page. You can create a Contact Page in your blog by obtaining your form's iFrame code. Go to Edit Posts > Edit Pages > New Page. Give it a title such as "Contact us" and paste the form's code in the textarea. This should solve your problem. If you have any other questions regarding JotForm, please feel free to contact us. Our team would be more than happy to assist you with anything. 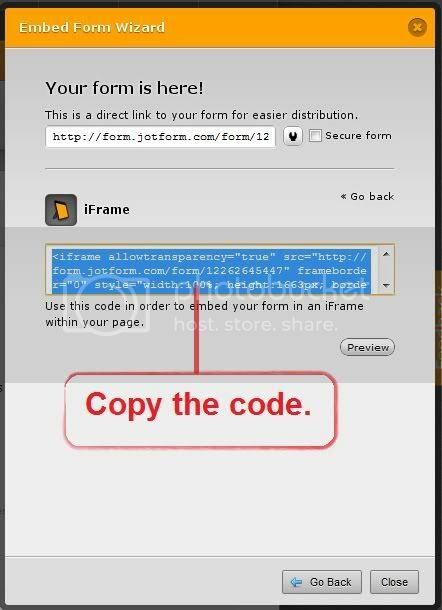 To get your form's code, click on "Setup & Embed" tab on the form builder toolbar, select "Embed Form" and click on "iFrame". And paste it to the textarea I've mentioned earlier. Hope this helps. If you need further assistance, you are more than welcome to drop us a message anytime. Friend I can put the iframe code in HTML? where I put the source code? He opens another page, I would like to open on the blog itself. Please try and let us now how it goes. I paste in my blog's HTML mode? is it? I add target = "_parent" in my iFrame in HTML and add my blog? Yes please, like how you did it previously. Paste the iframe code in your blog page's HTML editor within the <body> </body> tags. The should be placed as part of the opening <iframe> tag as shown above. Please try and let us know how it goes. I'm feeling very confused and afraid to change it =) I'd better leave it be. I have to change the Favicon to like my blog? No problem, AdelaideABreu. Please let us know if you need further assistance.